We're Tracking Skunks and We Need Your Help! Skunks are a nuisance in neighborhood settings due to the wide radius of impact that results from their spraying of people and other animals, and they can also be a vector for rabies and other diseases. Last fall, we began gathering data on skunk sightings and encounters, in order to help us better understand where sightings are occurring and to help us explore a treatment plan. With the onset of winter, our skunk population became mostly dormant, making treatment impractical. As spring approaches, we are mobilizing to help tackle what is becoming a community-wide issue. If you've had a recent skunk sighting or encounter in Bexley, please take a moment to fill out this form. Keep bags with you for dog waste pickup during your walk. Waste should be carried with you, and disposed of in a public waste receptacle or at your own property. Please do not place dog waste in or next to other people's waste bins, or in any other place other than a public waste receptacle or your own waste receptacle. Remember Bexley's leash law - dogs should be kept on-leash at all times when out for a walk. Schneider Park, with its main entrance at Astor just west of Sheridan, is dog-friendly, with a dog waste station, and a great natural setting for dog walkers. Make sure to bring more than one bag on your walk - dogs can be prolific! Compostable or biodegradable dog waste bags can be purchased at Pet People on Main Street, or online, and are an earth-friendly alternative to plastic bags. The last few days to register for our initial deployment of food waste composting containers are upon us! The deadline to receive a container for the first month of the program is February 15, 2019. After that deadline, the first deployment of composting containers will be distributed to participating households. The program will begin on Monday, February 25th! To apply for the program or find more information, please visit www.bexley.org/food-waste. After the February 15th deadline, we will be adding participants who register on a month-to-month basis. So, if you register on February 18th, you won't receive your composting container until April 1st. Shop Local for that Special Someone! Valentine's Day is a special day in Bexley, because there's so much you can do to celebrate the person you love the most. We've come up with a few date night options for Valentine's Day on Thursday! Don't have a significant other? No worries! 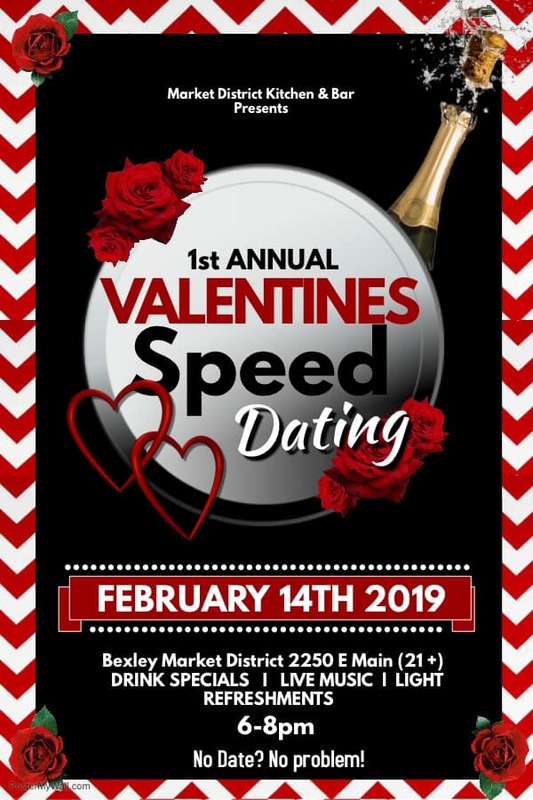 Market District Kitchen & Bar is hosting speed dating on February 14th. You never know who you might meet! Call the Bexley Public Service Department at (614) 559-4220, or Bexley Base it! As you might have noticed, potholes are a common problem during the winter months in Ohio. Bexley City crews strive to catalog and repair severe potholes in a timely and proper manner (often within 24 hours from when they were reported), however on rare occasions a few may go unnoticed. If you are aware of a pothole please report it to the City's Public Service Department at (614) 559-4220. Additionally you can report potholes on the Bexley Base mobile app!